With the space shuttle Endeavour's launch delayed by at least a week, the astronauts who will fly the orbiter on its final mission have returned to Houston to resume training until their scheduled liftoff. NASA called off a launch attempt on April 29 when an issue was detected with a power system, called an auxiliary power unit, which is located in the shuttle's rear, or aft, section. Meanwhile, Endeavour's six astronauts flew back home to Houston yesterday, said Mike Moses, chair of the shuttle's mission management team. The STS-134 crewmembers will remain in medical quarantine, Moses said, which is standard practice for spaceflyers to help prevent illness. "The purpose is to stay away from any contagious illnesses that would take a few days to show up and manifest," Moses said. "The crew reports to a quarantine facility that is on-site at Johnson Space Center – astronaut crew quarters." 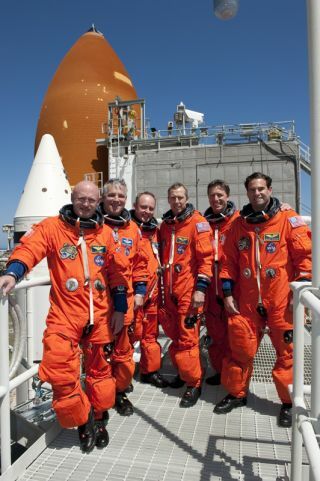 This week, the STS-134 astronauts -- commander Mark Kelly, pilot Gregory Johnson, and mission specialists Michael Fincke, Greg Chamitoff, Andrew Feustel and Roberto Vittori -- will practice different procedures in the various shuttle simulators at Johnson Space Center. "It's just refresher training," NASA spokesperson Kylie Clem told SPACE.com. "They'll be doing another simulation with their ascent and entry with flight control teams, but it's a light schedule." "The crews are unbelievably dedicated," Moses said. "They don't do anything in their free time other than study their checklists and practice their procedures. They put their time in to be ready to go, that's for sure." Endeavour is slated to fly its final mission to the International Space Station for a two-week trip to deliver a $2 billion particle detector aimed to study dark matter and other mysteries of the universe. The shuttle and its crew will also haul a platform packed with spare parts for the orbiting laboratory. Four spacewalks are planned. After Endeavour's flight, NASA has one more space shuttle mission planned before the end of the program: the June 28 launch of shuttle Atlantis.